It's been great to cook so much this month, but it's also been strange to not eat at restaurants more often: Gahlord and I usually tend to go out a few times a week, for either breakfast or dinner. We did hit the town twice, though, since several area businesses stepped up to the Eat Local challenge by offering dishes that fit within the localvore guidelines. Some of our friends chronicled their field trip to Pizza on Earth in Charlotte, which was by all reports fabulous. American Flatbread (at least their Burlington location; I'm not sure about the Middlebury and Waitsfield "hearths") offered one veggie and one meat special throughout August. Unfortunately, American Flatbread couldn't get local flour in the commercial quantities necessary, and I was being a stickler for details, so I didn't try out their localvore 'za. Gahlord and I visited Smokejacks on Church Street for dinner, toward the beginning of the month, and we each got the localvore entrée they've been featuring: a big steak from Laplatte River Angus Farm, served with grilled tomatoes, zucchini and summer squash, and new potatoes. 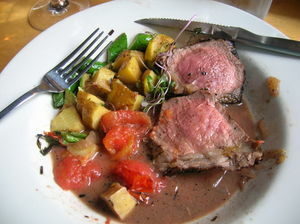 Our waiter was very helpful in finding out the sources of ingredients, and we talked about local vineyards quite a bit. I felt like a bit of a poser refusing the grainy goodness of the bread basket (not made with local flour), and asking whether the vinegar used in the dressing for a side salad was local (it wasn't, so I didn't get it). But apart from that, the meal was a hit. Everything was delicious. This photo doesn't really do it justice, but here's what my plate looked like halfway through, when I finally remembered to whip out my camera. The other prepared-local-food offering we sampled was at Viva Espresso in Burlington's Old North End, this Tuesday. They've stocked locally grown peppermint tea all month, and at least one baked goodie per day made with all-local ingredients. 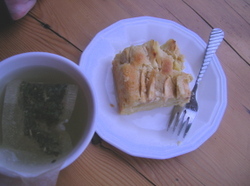 Gahlord had an apple-cream-cheese square, and I got a rhubarb muffin. 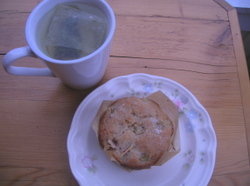 After sampling some of G.'s breakfast in the name of reportage, I can say both items were very tasty, though I found the muffin a bit sweet. I have to admit I've run out of localvore steam the past few days. I've stuck with the challenge, but my time in the kitchen has been a bit uninspired: I haven't made many new dishes this week. Instead, I've stuck with standby preparations that I've made before: scrambled egg sandwiches, bean dishes, and leftovers from Sunday's corn-on-the-cob grillfest. Most lunches and a few dinners have been black beans with fresh tomatoes, some of the Red Hen localvore loaf, and the remainder of the wedge of Frog City Cheese I opened way back on the first of August (still perfectly OK). 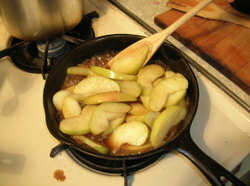 On a roll after the caramel popcorn, I did make honey-caramel-covered apple wedges on Tuesday night, and they were very tasty, if tooth-endangering. I just cooked the caramel a bit longer than in the popcorn recipe, and added a bit more salt. Leftovers were twisted into bits of wax paper, as a sort of butter-toffee candy. Ah, sweet memories. Although today is the last day of the challenge, I'll follow up with a few wrap-up posts tomorrow and over the weekend, before putting this blog to bed. Also, look for an essay on my Eat Local experience in next week's edition of Seven Days. That's what we got last night! 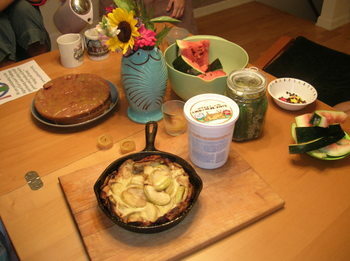 Thinking that it might be nice to have a mid-month pick-me-up, my sub-group of localvores in Burlington convened for a potluck consisting solely of after-dinner sweets. This version turned out really salty; I'm not sure why, but I guess I may have to adjust the recipe a bit. We substituted blueberry vinegar for lemon juice, to keep it local, and that may have made it taste a bit weirder than usual. I'll try again with this in a few days. Other, tastier treats on the table included a strawberry cake with honey-caramel frosting (made with frozen local berries), little cups of sweet custard made with fresh corn and topped with a currant-and-blueberry sauce, and an entire watermelon from the Intervale (one of the crunchiest I've ever eaten). Oh, and to cut all of the sweetness there were also tangy, spicy, homemade "quick" dill & garlic pickles, cured in the fridge, and lots of lemon balm tea. Honey: 3/4 cup of honey for each cup of granulated sugar, then reduce the liquid in the recipe by 1/4 cup and add 1/4 teaspoon baking soda. 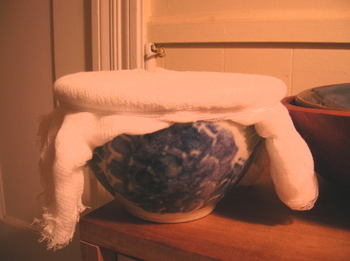 Reduce oven temperature by 25 degrees. Honey tends to make things darker and chewier. Maple Syrup: Substitute 3/4 cup maple syrup plus 1/4 t baking soda for each 1 cup granulated sugar and reduce liquid by 3 tablespoons. Use a lighter grade if you want to avoid a heavy maple flavor. I find it's usually helpful to beat the additional baking soda right into the honey or maple syrup before you add it to whatever you're making. They honey will turn an opaque, creamy color, but that's normal. 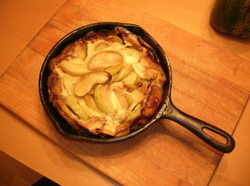 Oh, I did make that frittata last night, and had it again for lunch today. Here's what it looked like. I think the finger foods made the meal: the cherry tomatoes were delicious, and the raw green beans were so good and crispy-crunchy that I wonder why anyone would ever cook them. Normally I'd spend lots of time prepping and steaming green beans, but if it's not chilly out, now I think I'd rather eat them fresh, by the handful. Dinner tonight will either be more roast chicken or something else cobbled together from various leftovers. And afterward? Gahlord and I might try to make something Mandy mentioned last night. Localvore carmel corn: popcorn topped with hardened honey-butter. Good heavens. The potluck was fun. 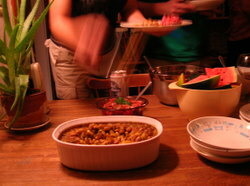 About 15 people came over and brought a bunch of different dishes that added up to a well-balanced meal. 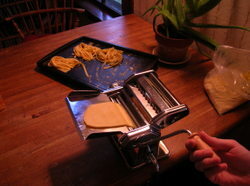 When I got home, Gahlord was already making pasta, cranking out egg linguine. When we cooked it later, though, it kept sticking to itself, and it ended up kind of like dumplings. G. says he'll try adding more flour next time. The carrot cupcakes turned out OK. I substituted 1/2 c. of honey and a bit of baking soda for each cup of sugar, and used about 3 T less olive oil to make up for the added liquid. The batter looked really gooey when I poured it into muffin tins, so I was sure they'd end up all over the oven, but everything worked fine, and they actually turned out far lighter than I'd expected. I frosted them with cream cheese from Champlain Valley Creamery, mixed with maple syrup and some dried ginger. 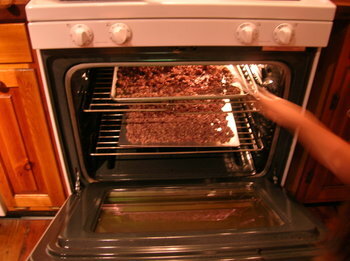 Of course, I forgot to take any pictures of either the batter or the finished cakelets. They got eaten pretty quickly. Other stuff I cooked: a slow-oven bean bake, this time with potatoes, onions and curry, and a cabbage/carrot slaw that also contained grated onion, garlic and apple, dressed with salt and cider vinegar. My new favorite drink, of which I mixed up several glasses last night, is a combo of water, cider and blueberry vinegar. Sounds weird, I know, but it tastes like lemonade. Besides cider and maple-flavored milk, other drinks included a jug of wine made by a friend's coworker, a bottle of Big Barn Red from Boyden Valley Winery in Cambridge, and some Egyptian-style blueberry-honey mead my friend Mandy made. (Check out her step-by-step photos!) The mead was good, if a bit fizzy, and definitely tasted of honey. Non-localvores and those of us making the "Drunken Marco Polo" exception also drank beer. In the middle of a conversation, I absentmindedly opened a beer and almost sipped it before Gahlord stopped me. I thanked him later. Other dishes people brought: tomatoes layered with mozzarella and basil, local chevre to spread on bread, a tomato salad, and watermelon. There was also rice, quesadillas and tortillas for folks not doing the challenge. I think I want to make ice cream this weekend. Further bulletins as events warrant. 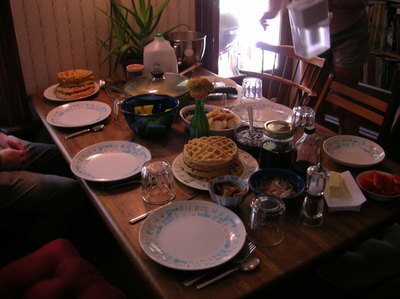 On Sunday, Gahlord and I had four friends over for brunch. Everyone brought something, and I made multigrain waffles on a borrowed iron. 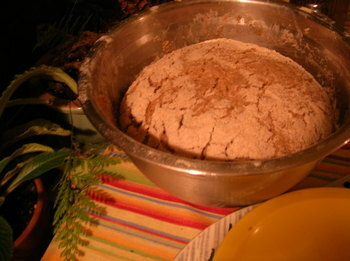 In terms of starch, which I seem to be preoccupied with a lot these days, the batter contained all-purpose flour from Champlain Valley Mills in upstate New York, with a bit of cornmeal, wheat flour and rye thrown in. Before last weekend, my waffling experience was limited to a cast-iron stovetop device that was really not very fun to work with, but these modern waffle irons, with the light that tells you when your waffle is done? It's almost enough to make me run out and buy one of these dealies. Gridded griddle cakes weren't the only item on the menu, though. We had waffle toppings: a red raspberry and red currant sauce, a fruit compote of blackcurrants, blueberries and blackberries, and red currants, whipped cream with honey, and two different grades of maple syrup, A and B, for taste-testing. Savory items included scrambled eggs, a potato-leek gratin, beet greens, fried onions, and oyster mushrooms from Colchester that were on sale at City Market. We also had wedges of fresh tomatoes and yellow watermelon. To drink, a choice of cider, water, milk, or an herbal tea christened '100-mile tea' by my friend Mandy, who blended it herself. I can't remember every single herb in there, but I know it contains mint, lemon balm, red rasperry leaf, red clover blossoms, and calendula — all grown within 100 miles of Burlington. 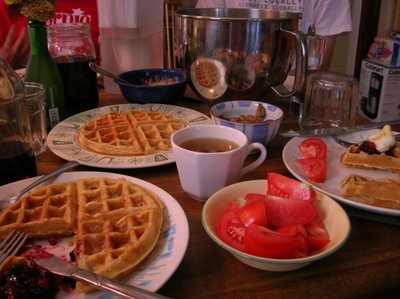 All in all, it was quite a repast, and since I made a vat of waffle batter, we've been eating leftovers from this meal for the past few days, plus finishing off the ratatouillle and a couple of salads that were in the fridge. Good thing there's no sugar in the waffles; it's easy to put them in the toaster and then use them as casings for leftover sauces, cold salads, or what have you. Breakfast is such a hopeful meal, and this week I've been eating morning foods a lot, it seems: Yogurt, granola, waffles, eggs. It keeps me going. Here's a closeup of the waffle action. In bread news, the sourdough experiment finally yielded edible loaves, after a bit of fussing. 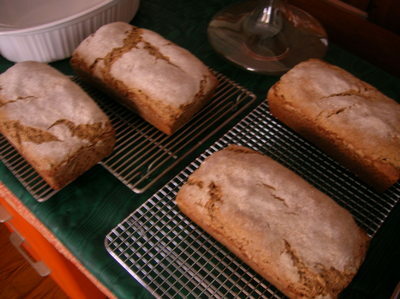 I had to sprinkle a bit of yeast into it to jump-start it again, and nurse it along with rolled oats, milk, and white flour before adding any more heavy whole-grain flours (the previous two loaves were 100% whole wheat, and just didn't rise). The quantity of dough doubled as a result of the cosseting, which was great: I gave two loaves away, and put one and a half in the freezer. Our second of four Red Hen localvore loaves was picked up today and is now in the bread bin, so the sourdough will be our emergency ration for next Monday's sandwiches. I'm not unhappy that I baked up all of the dough; I didn't really want to worry about killing it again. Finally, a blueberry vinegar update: It worked! After a week of sitting under cheesecloth, the mushed-up blueberries and water had turned healthily sour, and I strained it into a jar. I'm excited about the prospects of fruit salads made with this stuff. The first week of the localvore challenge, blueberries, raspberries and currants were the available fruits. Now, only a week later, we have peaches and small yellow plums from Champlain Orchards (not listed on their website; maybe they only grow small batches for commercial sale? ), the first local apples are coming in, and blackberries and several different types of melons are obtainable. 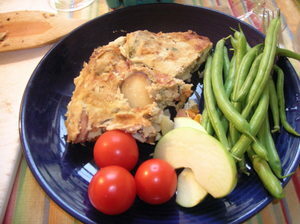 Dinner tonight was the last of the potato-leek gratin and some of the oyster mushrooms in an omelet, with a tomato-basil salad dressed in a garlic vinegarette. We also had a bok choy salad, roasted eggplant, spicy Tex-Mex cabbage, grilled hamburgers made with beef from Laplatte River Angus Farm, water, cider and wine. For dessert, we ate what my friend Mandy had baked and brought: a dough-based custard dessert she called a "dilip," apparently named after an Indian chef. This one was full of blueberries, not too sweet, and definitely tasty. We didn't really have any dried fruit for the granola, so Allaire mixed in some mushed-up, gently cooked blueberries to give a slight fruity flavor. She made two batches, one with honey and olive oil, and one with butter and maple syrup. The latter is my new favorite thing, since the saltiness of the butter goes really well with the delicate maple sweetness. (Recipe to follow). Before we left, everyone got a bit of toasted-oat tastiness to take home in a paper bag. Normally I prefer muesli, but there aren't a lot of really crunchy-sweet localvore foods that aren't vegetables, so having granola for breakfast really made my day. 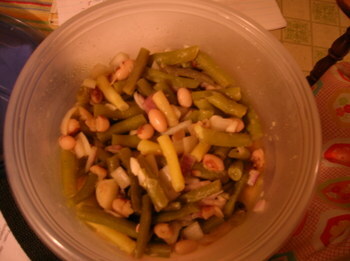 For lunch, I ate Cabot cottage cheese, three tender carrots, and the last of the bean salad. Gahlord has been craving pasta in a major way, and although we don't really have time to make the wheat-flour kind (which requires a resting period before you roll it out), we might try making potato gnocchi for dinner tonight. Hooray! The fridge is behaving. I've never been so excited to see ice before. I'm sure if it had broken our landlord would have replaced it eventually, but that might have taken another week. 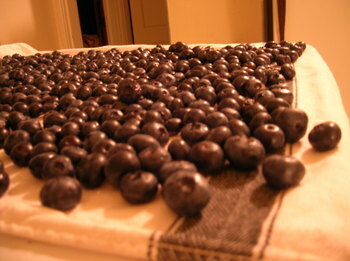 The great fridge warming caused select fruits in our big tupperware bucket o' blueberries to become mushily overripe, so I sorted through them, washed and dried the good ones, and prepped the squishy, odiferous ones to become blueberry vinegar (mushed them up further with a little bit of water). We'll see if this experiment works as well as the cider vinegar. Fermentation is nifty stuff. 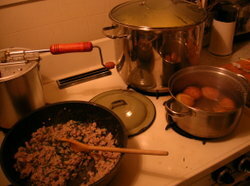 It's pretty much letting your food prepare itself; you just have to set up the ideal conditions and know when to step in and either eat or cook the results. My friend Mandy cooks a lot from the book Wild Fermentation: The Flavor, Nutrition and Craft of Live-Culture Foods (she's using it to make Egyptian-style honey mead; more updates on that as the month progresses!). City Market is bringing the author, Sandor Ellix Katz, to the Fletcher Free Library to speak at 6 p.m. on Monday, August 28. I hope to go. I've never heard of the Fletcher Free charging admission before, so the $5 tickets must be managed by City Market. 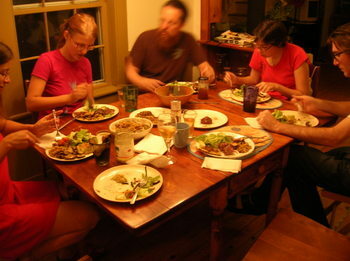 Mandy and her boyfriend Greg hosted a family-style dinner at their apartment last night. Everyone brought either a dish or ingredients, but they made most of it: we consumed corn chowder, superlative homemade biscuits (recipe on the Burlington localvore blog), cucumber and carrot sticks with bean dip, cornmeal crackers, spicy cabbage salad, apple pie with oatmeal crust, and maple ice cream. We also widened our circle of acquaintance with Vermont-grown-and-made vintages and spirits, but that recap deserves a separate post. One of the great things about Localvore month so far has been the wonderful sense of community. Counting the pre-localvore leftover potluck, Gahlord and I have had dinner with between two and 12 friends four times in the past seven days. The challenge would still be worthwhile if I were doing it alone, but cooking with and/or for a group makes it much more fun. There's been lots of impromptu bartering, oats for flour, bread for yogurt, etc. I feel like we've been running our own little mini-economy. It turns out the granola-making party is tonight, in Williston. The huge bag o' oats (grown organically just across the border in Quebec) will be whittled down bit by bit in the oven, and soon I'll have crunchy topping for my morning maple yogurt fix. Our fridge broke today. Or rather, it became temporarily disabled for a 24-hour period (we hope). It's 20-plus years old, and not the most efficient piece of machinery, and about every year and a half it just gives up and needs to be unplugged for awhile. I'm hoping that's the case again this time. Gahlord wrestled the fridge out from the wall and unplugged it. I wrestled it back, then spent a big chunk of this afternoon cleaning things out of it, and thinking about the preposterous amount of frozen and canned edibles I tend to stockpile. My grandfather lived through the Great Depression, and as an adult took a very long-term approach to shopping. Whenever I visited him as a kid I was amazed to see he'd filled not only the pantry, but an entire auxiliary room with canned and boxed food. I'd find plastic bottles of soda in the linen closet, and huge economy packages of toilet paper under the spare room beds. My mom inherited this approach to a lesser degree, and passed it on to me, particularly with regard to edibles that need to go in the fridge. 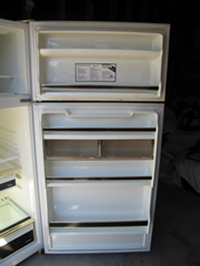 It is rare to see empty space in our icebox. I wonder at the usefulness of the hoarding instinct. The fridge had already been off and cooling for at least 20 hours before we realized the situation, and with the localvore challenge, it was pretty frustrating to think of all of the farmers' market produce, U-pick berries and local dairy items I'd tracked down gradually going bad. Gahlord had been given a pork roast from a pig raised by a friend of a friend in the Northeast Kingdom, but that was in the freezer, so I'm pretty sure it's still OK.
Two friends volunteered temporary fridge and freezer space (thanks, Mandy and Angela! ), and hopefully tomorrow all will be back to normal, albeit a little less stuffed-to-the-guppers. I hope to maintain shelf visibility henceforth. In food-related news, last night Angela hosted a grilling party at her house, where about a dozen folks consumed locally made tempeh with veggie cream gravy, potatoes, salads, grilled zucchini, homemade potato-and-beet chips, polenta, more of the buffalo (not beefalo, but actual buffalo) and turkey burgers, and lots of corn on the cob. I made blueberry pancakes this morning. 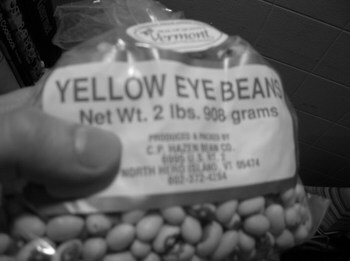 They were yummy, and that's really what I've been eating all day. For dinner last night Gahlord and I picked up some local ground beefalo from City Market, and several ears of fresh local sweet corn. I made patties of the meat with some garlic, an egg, and salt and pepper, and G. grilled those, and soaked and grilled the corn. Potatoes from Lewis Creek Farm, bought at the Burlington farmers' market last weekend, were sliced and wrapped up in a foil packet with butter and rosemary to gradually get hot over the coals. A friend stopped by with some more corn and ground turkey breast from Misty Knoll Farms, which got the same treatment as the red meat, but minus the egg and plus some chopped scallions. A green salad with local lettuces, raw green beans and shelled peas, and a red currant dressing I made up, balanced out all of the meat and starch. Everything was delicious. I love grilled corn. The kernels are basically steamed inside the husks, so they're really tender, but the outsides of the husks get charred, which makes the whole ear taste slightly smoky. "Beefalo" might sound kind of odd, but it's actually a USDA term for a cross between American bison and domestic beef cattle. It tastes pleasantly of game, and is very lean. A little goes a long way! 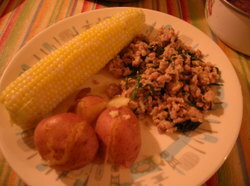 The ground turkey was another great find; very flavorful with the scallions and salt. Happily, we have lots of leftovers. Breakfast this morning was a piece of sourdough bread I baked last night (after patiently waiting 2 days for it to rise! 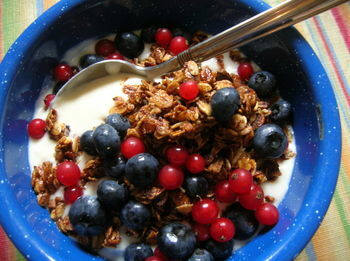 ), along with a bowl of stewed rhubarb-and-honey in more of the Butterworks Farm maple yogurt. Oh, and a glass of water. I am beginning to miss coffee and tea more than I thought I would — no caffeine headaches or anything, just a feeling of not being able to look forward to pick-me-ups that I sometimes get from those substances. I know water is great for you, but I'd like locate some local mint and other dried herbs, so I can have a morning routine again that involves a hot cup of something. Lunch was leftovers from last night — half a beefalo patty and some green salad, with a few pieces of sourdough. I anticipate more of the same for dinner tonight, with some cold corn-on -the-cob, since we don't really have time to cook this evening. I might boil beans for a salad for tomorrow, if I get a few minutes before bed and the house isn't too hot.